This article on Business Insider may open with a quote from Michael Scott, but it goes on to pose a very interesting question: What is the big deal about diamond engagement rings? They feel solidly embedded in age-old tradition to many of us, but is that really true? As it turns out, no. Apparently, the entire "tradition" started with a De Beers ad campaign in...1938. (So, it's older than the columns on Cher Horowitz's house, but not by a lot.) Before then, diamond rings weren't at all commonplace on the fingers of American spouses-to-be. By now, most of us are aware that the supposed rarity of diamonds is artificially created by a cartel controlling all supply to falsely inflate demand. But, it's not just the market that's under the strict grip of De Beers — it's your emotional response and attachment to something much greater. 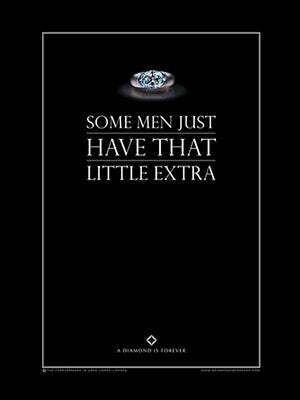 Good advertising is, at its most effective, designed to make you need something you didn't even know you wanted, and the diamond powerhouse has done a particularly incredible job with this. Until the mid-20th century, diamond rings were actually an outgoing trend, and in the face of wartime economies, the picture was only getting bleaker. Madison Avenue ad agencies came to the rescue when they decided to re-brand diamonds as a status symbol, essentially manufacturing the idea that the size of the stone corresponds to the strength of a man's love (which might explain why some couples keep investing in diamond rings for various anniversaries and occasions, well after the initial engagement, into old age). De Beers, with the help of some industrious Mad Men types, created a tradition and a social convention in one fell swoop. Using marketing techniques ranging from British royal support to guides on how much to spend, they kept the cash rolling in, and suddenly, an outgoing trend transformed into tradition. And today, the idea is so ingrained in our understanding of love and marriage today that many couples can't fathom the idea of commitment without some serious bling. The history of how diamond rings came to be the, erm, gold standard for young lovers with a savings account reads like one of the greatest advertising plays of all time. And then, of course, there's the issue of conflict diamonds, still far more common than any of us would like to believe, Kimberly Process or no. Business Insider points out that the value of a diamond is basically nothing more than its function as a status symbol, and honestly, is that really worth the chain of awfulness that's triggered by our demand for them? You tell us: Is this exposé (not the first time it's been written, but certainly a worthwhile ready, anyway) enough to convince you? Photo: Courtesy of De Beers.